Nathan Myhrvold prepares & serves a fifty course meal for Ferran Adria — including salted red wine. This question pops up regularly, most often when there are different business functions (Procurement, Marketing, Technical) attending a taste session. Time and time again informal tastings lose sight of the objective, become sidetracked with unrelated discussions or everyone ends up just agreeing with most senior person at the meeting. For an internal evaluation to be successful and uncover meaningful insights, a simple framework should be followed. Doing so will maintain focus and ensure everyone's taste buds have an opportunity to have their say! Here are my top 5 tips for running an effective sensory evaluation. How can this be tackled? Begin by clearly articulating the objective(s) of the evaluation. Highlight and define the key attributes that you want to focus upon - use words and product examples to demonstrate scales. Instruct each evaluator to systematically work through the Appearance, Aroma, Flavour and Texture of the products - without interacting with other evaluators. Once complete, discuss as a group each attribute to gaining consensus of how the product is percieved. Re-visit the objective(s) and define the next stpes for the project. By following this simple framework, your product discussions will become more meaningful, you will address project objectives with more clarity and your projects will proceed quicker. Spike - perfect for shooting food commercials. 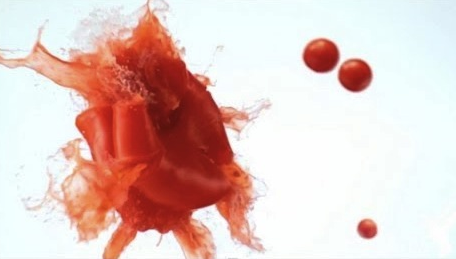 Ever wondered how food commercials capture the magical images of two tomatoes smashing into each other, the slow motion splash made by a hazelnut being dropped into a pool of chocolate or the speeding cork as it ejects from a bottle of champagne? The answer is simple - precision, repitition, robotics and a high speed camera named Spike. The Marmalade is a creative agency based in Hamburg, Germany who specialise in high end special effects for commercials. They have put this short video together to show how they shoot their commercials and when I stumble across it, I knew it would be worth sharing with anyone who appreciates food. This team spend hours building rigs and robots that can consistently pour in, pour out, flick, splash or spin food products and props. All this work is done to capture on film a fraction of second of action on high speed camera. Once the desired motion of the food has been achieved (flinging together two tomatoes), a highly maneuverable, high speed camera - 1000 frames per second - nicknamed Spike is programmed to record the exact moment of impact, splash or shatter or swiftly move down the glass as the beer is poured. This split second of action, slowed down ten times displays an artistic angle on everyday food and beverages that you wouldn't even realised occurs. And for more examples of their work be sure to check out their gallery. Proof is a scotch whiskey sensory evaluation game designed for the iPad. To begin, players can complete Scotch 101 to learn what scotch is, where it is made and how it should be consumed. Next, players are invited to test their knowledge while going on a journey through the regions of Scotland, the home of scotch whiskey. Proof defines 8 sensory attributes of scotch and then challenges the players to shape the whiskey flavour wheel to visually represent the presence and strength of each attribute. Players can then compare their flavour wheels to each other and that of a whiskey expert. To download Proof for free, head to http://proofwhisky.com/ (from your iPad) and follow the instructions. Proof was created by the team at Zeus Jones, Minneapolis. Violet Crumble vs Crunchie - what's your flavour? Chocolate covered honeycomb has long been an Australian favourite, but which do you prefer, Cadbury’s Crunchie or Nestle’s Violet Crumble? When spare time presented itself at the office, I put the taste buds to work to decide which I prefer. Both products come in vibrant foil packaging, and neither have a transparent window, instead keeping their contents secret from the world. As you'd expect, the vibrant designs on both packs is similar, although communicated using different colours. You may assume the coveted royal purple product belonged to Cadbury’s, but you'd be wrong. Nestle has continued its long association between Violet Crumble and purple while Cadbury’s Crunchie is is slathered in gold. Strip off the wrapper and the differences become more apparent. Side by side you notice different coloured chocolate. The Crunchie is enrobed in Cadbury’s iconic Dairy Milk while Violet Crumble has opted for a darker variety. The cross section photo (below) reveals the degree of difference in chocolate coverage thickness; Crunchie (62% chocolate) and Violet Crumble (59% chocolate). The density of the honeycomb differs with fewer air bubbles and a more pale golden coloured Violet Crumble. But we know that no one buys a chocolate bar to just look at..... lets eat! Biting into the Crunchie is best described as biting through a chocolate layer, and then chomping through air. There is no structure or resistance given by the honeycomb. It reminds me of biting through a hollow Easter egg. The Violet Crumble still shatters, but the honeycomb provides greater resistance on first bite. Chewing the honeycomb centre of the Violet Crumble conjures up images of eating chalk, but tasty sweet chalk..
Once in your mouth, they both become a mass of chewy chocolatey goo, but the Crunchie’s Rate of Disappearance is far quicker than that of the Violet Crumble. I tip my hat to Crunchie for using the Cadbury dairy milk chocolate. The combination of superior coverage and a familiar chocolate results in a better overall chocolate experience. Violet Crumble is less concerned with the chocolate flavour, allowing their honeycomb flavour profile to shine. As a chocolate bar, the lack of chocolate does play against them in when compared to the Crunchie. This is where the two products differ most. The Violet Crumble has a sweet taste and a simple clean honeycomb flavour. The Crunchie is super sweet. The honeycomb flavour wasn’t “clean” reminding me of overcooked toffee - the type that leaves a bitter, burnt sugar flavour in your mouth. Both bars made me thirsty, so I guess this comparison is best undertake with a glass of water close at hand. Honestly, I couldn’t split these bars by appearance, was swayed towards the Cadbury Crunchie for its superior chocolate coverage but couldn’t consume the whole bar because its excessive sweetness. The strong the caramelised flavours were also a turn off. Even with less chocolate, the clean flavours of Nestle’s Violet Crumble secures my preference. I have a friend who swears the best way to eat a Crunchie is by pressing your tongue up against the honeycomb and letting it dissolve away. You are left with a soggy, half melted chocolate tube but it is delicious. Try it, but be warned, it usually ends up a little messy. What is your favourite? How do you eat your honeycomb? Let me know your thoughts! Copyright © 2018 Radar Insight PTY LTD. All Rights Reserved.